There is much talk of learners ‘taking ownership’ of their studies. (Example) After all, it stands to reason that an individual will be more interested in what he is doing if he feels he is in control and understands it. Educators are storing schoolwork in the Cloud. This replaces exercise books or the school network for storage of students’ work. Will this trend help to encourage the notion of ‘Student ownership and responsibility’? To the average student’s mind, is his schoolwork really his, or does it ‘belong’ to the school or the teacher? Until now, learners attending school have borrowed paper, books or equipment. In the interests of tight discipline, learning has been highly structured, with the teacher firmly in control. Student submissions have been kept predominantly by the teacher on shelves, in files or on the school’s network. Thus the teacher has had to play the role of ‘guardian of the work’ which was handed in to him for assessment. When students left the school, their work would often remain in the premises or on the school network. With the Cloud, is the question ‘Shall I hand it in?’ still necessary? Not really. The work is already there, in the Cloud. The student has his work in a ‘place of his own’. The teacher can ‘look over his shoulder’, encourage, criticise, and assess, but the work does not need to be removed from the learner’s control. Why is Cloud better than having it on the school’s network? 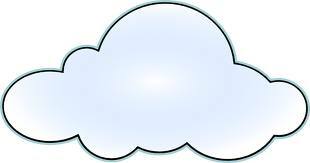 functionality … the Cloud offers a range of very advanced educational technology. A school’s network may provide basic storage of files such as Word docs, Powerpoints etc., and perhaps offer some basic functionality in a VLE, for example. It is unlikely to provide advanced educational applications, such as Schoolshape, capable of providing really useful functionality such automatic assessments, powerful language learning technology, scheduled personalised revision and homework, for example. If he can look back at what he has done, see what the teacher wants him to do in the future, and easily add a range of media to his portfolio, the student is likely to feel more in control of his education. Above all, he can truly ‘own’ it, take pride in it and improve it in the knowledge that it will remain his ‘property’ forever.